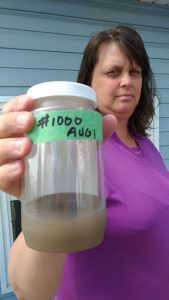 A North Kent Wind Project manager referred to a family’s water as “visually clear” in a press release, despite tests and photos that show otherwise. Senior Manager of Development Jody Law says the Ministry of Environment (MOE) notified him of Paul and Jessica Brooks’ complaint on Monday. Paul and Jessica Brooks live on Brook Line in North Kent and say they have been experiencing a plugged water pump from nearby wind tower pile driving. Aecom, the engineering consultant behind the wind project, scheduled a site visit to sample the family’s water on Wednesday. According to Law, the tests show no issues. “The sample was visually clear and colorless with no visible sediment. We have requested expedited analysis from the lab but, at this point, there is no empirical evidence of an issue,” says Law. However, Water Wells First spokesperson Kevin Jakubec points out that a Ministry of Environment provincial officer made a visit to the home on Tuesday and found drastically different results. According to Jakubec, the test results from the MOE show extremely high turbidity levels at 86.8 NTU. The Ontario Drinking Water Standard’s objective turbidity level is 5.0 NTU. To meet conditions of the wind project’s permit, Pattern Development delivered a 2,000 gallon water tank from Ingersoll to the Brooks residence on Saturday. “He said that there is no empirical evidence of an issue. I think the delivery of a water tank is recognition of an issue. Given that Mr. Law is the project manager, you’d hope he would know what is going on with this project,” says Jakubec. Jakubec adds the project permit ensures that families, like the Brooks, who complain that their well has been affected by the turbines, do not have to pay for the costs of the investigation or water tanks. Paul and Jessica Brooks demand that North Kent Wind executive Jody Law issues a full apology and retraction of his press release. Pattern Development has scheduled another meeting with the Brooks family on Tuesday to further review the water situation.